I think most of the default Beamer themes look terrible. Clashing colors, inconsistencies between flat and “3D” graphics (I’m looking at you, ball bullet points), and general visual clutter bring back memories of the early 90’s internet. In my opinion, the least offensive themes are the simplest – black text on a white background, perhaps with a single blue accent color for titles, bullet points, et cetera. Themes like this one are quite common in biostatistics presentations. Sometimes better bullet points are used. From the Beamer Theme Matrix. The theme pictured above has a few things I like and a few I don’t. Mostly black text on white background – easy to read. Blue highlights make it easy to pick out important bits – titles and bullet points. Section titles provide context for each slide. Current page number makes it easy to refer to a specific slide (e.g. when asking a question). Too many colors gets distracting. Unnecessary information abounds – presentation title, subsection titles, author, date, total page number. Presentation controls take up space and are rarely, if ever, used. This slide actually looks a lot like the blog with the theme I’m currently using. Consistency, right? The full example presentation is available on GitHub. The decisions I made while designing the Itasca theme were of course heavily influenced by my own use cases. 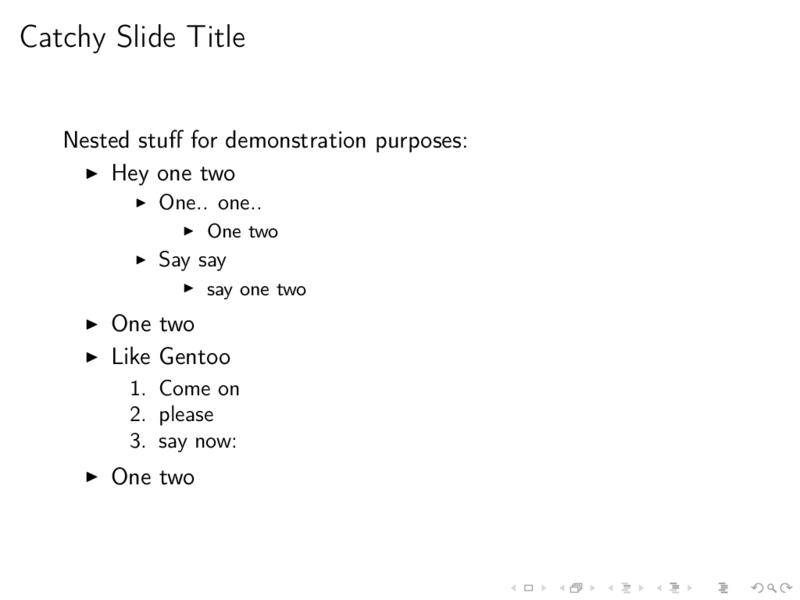 I usually see each presentation in two different settings – once while being presented and perhaps several times on my personal computer while reviewing. 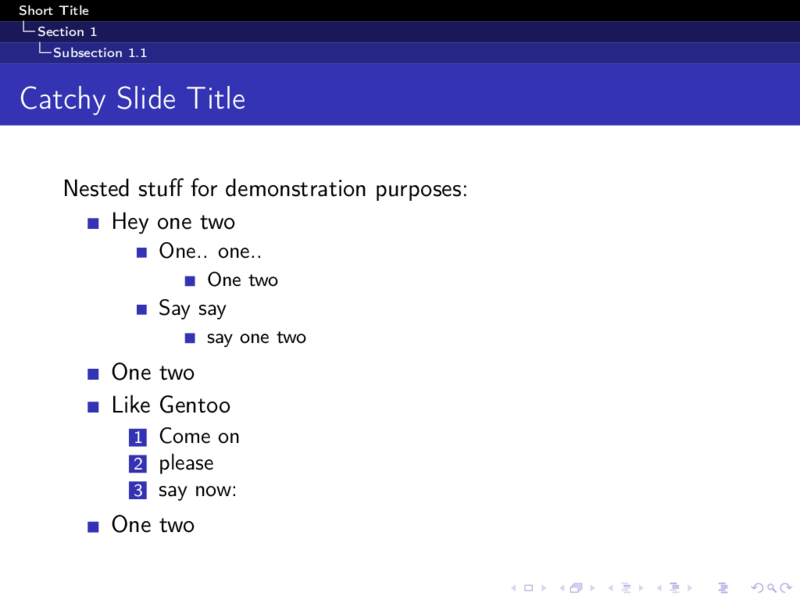 In the first case I’m viewing the slide stack linearly while the presenter is speaking, so I want as few distractions as possible so that I can focus on the inner content of the slide and the words of the speaker. Sometimes I need to reinforce the context of a slide by checking the title of the current section and the surrounding sections. In order to have this information available but not intrusive, I lowered the contrast between the section titles in the header and the background so that they can be read when you’re looking at the header but don’t draw your attention there when you’re not. A similar reasoning led me to include the current page number in the footer so that slides can be referenced easily when asking questions. However, I feel that a total page number distracts, so I left it out. In the second case I’m often looking jumping between slides and sections looking for individual pieces of information. When doing this it is very useful to me to be able to quickly pick out which section I want to go to and immediately jump there. Thus I’ve included all of the section titles in the header as bookmarks so that clicking one will go to the first slide in the corresponding section. Since the sections other than the current one have low contrast with the background, they don’t distract during the live presentation. Things can get ugly if there are too many sections or their titles are too long, but in my experience even hour-long presentations only need around five sections at most, and I’m not against encouraging succinct section titles, either. Finally, I don’t recall ever seeing someone use the presentation controls, so I left them out. The theme files as well as the readme are available on GitHub. I’m new to Beamer theming so I wouldn’t be at all surprised if there are bugs or style elements I’ve left out. If you find one please note it in the issue tracker.